More info at Become a fan of us on Facebook! The Gauge 1 model railway at Bekonscot Model Village, Bucks. 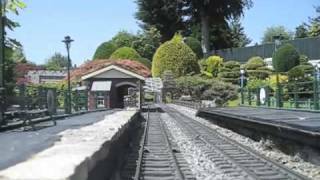 It’s a 10 scale mile model garden railway of 1/32 scale, in a 1/12 scale miniature village. The line was started circa 1929 and has been updated continuously for 80 years. We strapped a camera to the front of one of the engines and sent it off – we’ve added some subtitles so you can see what you’re passing. Model railways rock. The huge model railway has evolved since those early years, from Bassett-Lowke LNER and GWR outline stock through to modern image British Rail – when at one time, class 47, class 37, Hymek, western class 53, intercity 125 and even DMU stock ran. In the early 1990s, interest in the railway’s heritage regained, and it was decided to revert to a classic 1930s appearance. Therefore you’ll now see classic GWR railmotors, EMU, GWR 94xx tank locos, LMS Jinty, SR Q Class and many more freelance locos on the route. The whole system is controlled by computer, interlocked with hundreds of relays for points and signal operation. Note that the signals are missing in this video, as they are currently all being refurbished. The complex trackwork around Maryloo station is controlled by a Westinghouse lever frame in the signal box (where this video begins and ends) when the signalman wants to intervene. This train was preset to run non-stop – but of course would need to stop if another train was in the block ahead of it. This video took four takes to get right – we had to be nimble with the manual signals to make sure no trains ahead of this one stopped progress, or made it wait on the single track sections! Usually there are 9 to 11 trains in operation at any one time; a selection of them are seen on this video. Perhaps we should get a Thomas The Tank Engine for the line…? We’re in Beaconsfield, Buckinghamshire – which is on the Chiltern Railways route from London Marylebone to High Wycombe, Banbury and Birmingham. hope you enjoy it as much as we did making it!